So here it was the day before Thanksgiving and I wanted to draw a turkey. I called around trying to find a live one to sketch but failed. Then I tried to find a taxidermy turkey. No luck. The ranger at the Tilden Nature Center said they did have a collection of taxidermy birds including owl, songbirds, turkey vulture…but no turkey. Wait! Turkey Vulture! It’s a bird, it’s named Turkey so why not? I called back to confirm they had it in stock (they rent it out: $10 for two weeks) and then drove up to Tilden Park. Vultures are the “garbage collector of the bird world” and eat everything from dead mouse to moose. If they are in danger and can’t run, they vomit their foul-smelling meal at their enemy. the freedom, security, comfort, and good health that allow me to live this wonderful creative life. I know none of the above is guaranteed or permanent so I try to be grateful every day, not just Thanksgiving. What are you thankful for? I can’t imagine renting a stuffed bird for an hour let alone a week, but it’s a good idea. Great turkey vultures Jana. 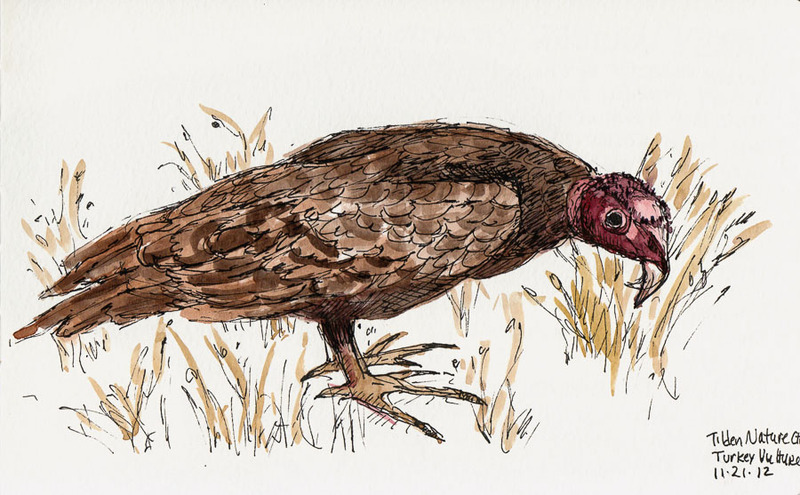 My Mary also rendered turkey vultures on her blog. You should check them out at http://thebackdoorartist.com/2012/10/09/wings-of-autumn/ . Turkey vultures must be coming into fashion! Oh, by the way, be careful which stuffed bird you eat on Thanksgiving. Great bird! A HAPPY THANKSGIVING DAY to you and your family, Jana. What a wonderful idea, rent-a-bird! Love your drawing that brings the taxidermied bird seemingly back to life. I am thankful for those things you mention, my family and everyone’s good health, for being able to draw everyday, for American freedom, and for the internet that brings so many distant people and ideas near. Your blog is so much fun, always some surprise and some unexpected delight. I hope you and your family have a wonderful Thanksgiving Day and send wishes of peace and good fortune to all the fellow readers. Happy Thanksgiving Jana! Thank you for always inspiring me!